Go with the flow | Stand Up and Speak Out! Nearly every young girl has read Are You There God? It’s Me, Margaret by Judy Blume. For those men who read my blog, it’s a coming-of-age novel and one of the main issues that Margaret faces is getting her period. The book has been in publication since 1970 and has helped countless tweens understand the confusing years when puberty hits. The newer editions of the book have an updated version of Margaret going to buy her first sanitary pads. The more recent version has her buying adhesive pads. The original version had her buying a belt to strap in the sanitary pads. Since the newer version didn’t come around until 2006 (when I was 26), I read the original. It scared me to death. I’d never seen a sanitary belt and didn’t understand how they worked. I also pictured myself having to wear it outside my pants, which then confused me more. Once I found out that I wouldn’t have to wear a belt, I started to wonder what women did before the belt was invented. Now, decades later, I have a firmer grasp on the answer. 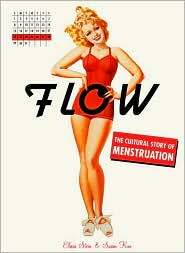 I found it in the book Flow: The Cultural Study of Menstruation by Elissa Stein and Susan Kim. The book takes the reader on a history of the period. It not only gives insight into what women wore before adhesive pads were invented (ever wonder why Victorian women wore so many layers?) but also a look into the sanitary napkin industry and its advertisements, menopause, hormone replacement, douching (one of Lysol’s original uses) and so much more. For the sake of my readers who don’t want to know, I won’t go into any details. But I do think that every woman should read this book. It is fascinating how far we’ve come and what myths have been broken up along the way. There’s a lot to be said for menopause! I could have explained the belts to you, if you had asked.